Born Feb 17 19143,6,7,8,9, Youngsville, Lafayette Parish, Louisiana3,6,7,8,9 [Bellevue, Calcasieu Parish, Louisiana10]. 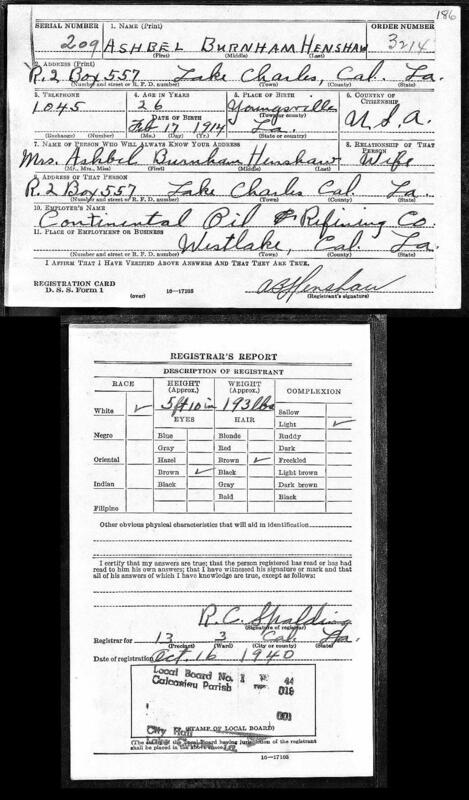 Henshaw, Ashbel B., head-of-household, age 26, born in Louisiana; completed 4 years of high school; on Apr 1 1935 was living in Lake Charles, Calcasieu Parish, Louisiana; rented home ($35/month rent); occupation: laborer, oil field; worked 29 weeks in 1939; $910 wages in 1939, plus other income. Henshaw, Barbara A., wife, age 25, born in Wisconsin; completed 4 years of high school; on Apr 1 1935 was living in Lake Charles, Calcasieu Parish, Louisiana; $0 wages in 1939, plus other income. Henshaw, Barbara, daughter, age 5, born in Louisiana; on Apr 1 1935 was living in Lake Charles, Calcasieu Parish, Louisiana. Henshaw, Frances M., daughter, age 1, born in Louisiana. 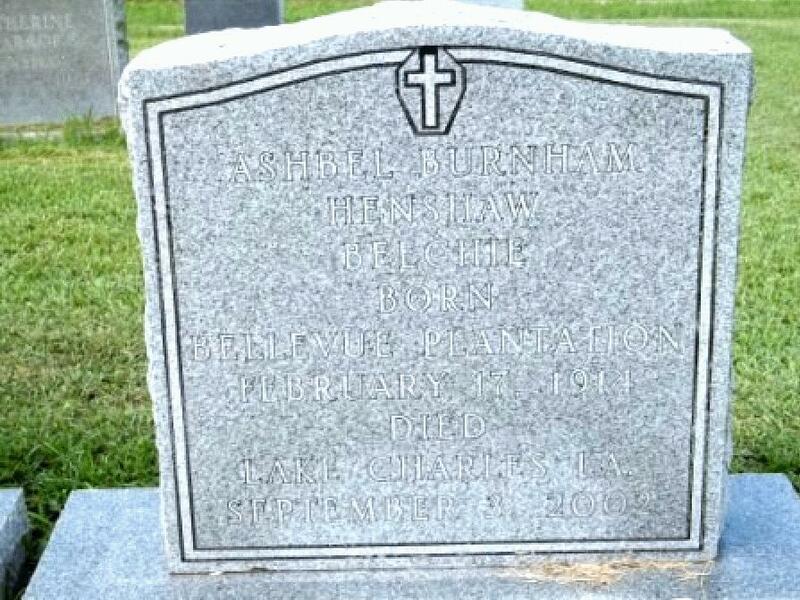 Ashbel Burnham "Beechie" Henshaw died Tuesday, Sept. 3, 2002, in his home. He was born of Bellevue and had lived most of his life in Lake Charles. He graduated from Landry Memorial High School. He was an outstanding athlete and received a football scholarship to SLI. He was an avid outdoorsman and was well known for his skills in fishing, hunting and golf. He especially liked music and played several instruments. Friends and family alike enjoyed his storytelling and quick wit as well as his sometimes amusing innovations as a creator-craftsman. He worked as a seismographer and was retired from Texas Gas Co. He was a member of St. Michael and All Angels Episcopal Church. Survivors include his wife of 68 years, Barbara Allen Henshaw; four daughters, Barbara Roberts, Frances Gill and Mary Jernigan of Lake Charles, and Linda Weeks of Lafayette; eight grandchildren, Bill Roberts, Christy Moreau, Greg Gill, Gordon Gill, Edward Jernigan, Ginny Jernigan, Amy Mutscher and Whitney Weeks; and four great-grandchildren, Burnham Roberts, Margaret Roberts, Katelyn Gill and Cade Mutscher. His funeral will be at 10:30 a.m. Friday, Sept. 6, in St. Michael and All Angels Episcopal Church. Graveside services will be at 2 p.m. in Rose Hill Cemetery in New Iberia under the direction of Hixson Funeral Home. Visitation is 7-9 p.m. today in the funeral home and from 9 a.m. Friday in the church. Memorials may be made to St. Michael Church, Ducks Unlimited, Hospice of Southwest Louisiana, or to the charity, church or organization of one’s choice. The family especially appreciates the long-term loving services of caregivers Carolyn Taylor, Barbara Leger, Dana Daigle, Jane Foster, Josephine Hilburn and Murel Vincent, and the Hospice of Southwest Louisiana. 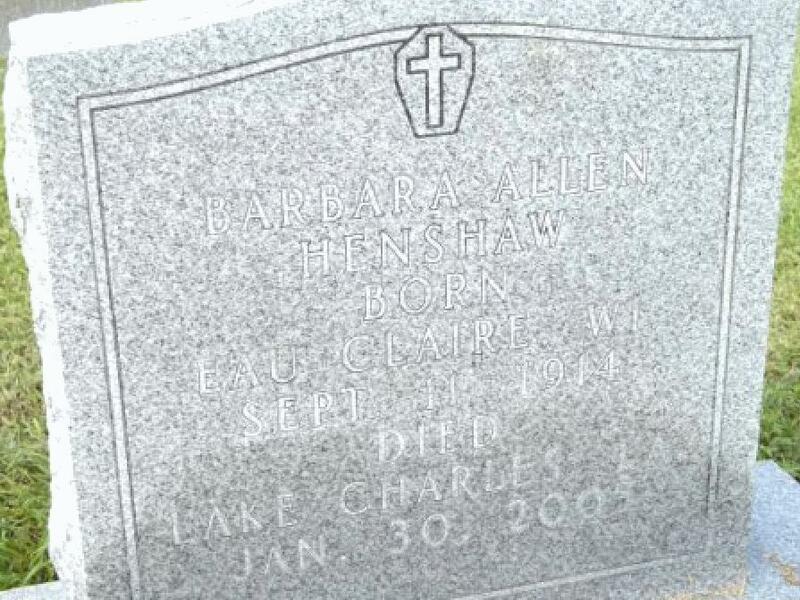 LAKE CHARLES - Barbara Allen Henshaw, 90, died Sunday, Jan. 30, 2005, in her residence. Her memorial service will be held at 10 a.m. Thursday, Feb. 3, 2005, in St. Michael and All Angels Episcopal Church. The Rev. Dr. Peter Cook will conduct the services. A graveside service will be held at 3 p.m. in Rose Hill Cemetery in New Iberia. She was born in Eau Claire, Wis. and moved with her family to Lake Charles when she was 11. The Allen family lived for many years on Kirby Street in the home that later became the site of the YMCA. Barbara was a graduate of Lake Charles High School and leader of the first drill and pep squad there. Barbara was a beautiful, gracious woman whose lifelong interests included a love for reading, good music, playing bridge, travel, dancing, entertaining in her home and active correspondence with distant family and friends. She loved life and wanted to try it all. She had a great desire to learn all she could about everything. She set the bar high and aspired to the excellent and beautiful. She loved the classics - symphonies, ballet, lectures, movies. Adventurous, courageous, fearless, fun, Barbara was an energetic woman who loved spending time with family and friends. She was a devoted wife, a generous and loving mother to her children and a faithful friend to many. Her ready smile, her sweetness, her wit, her sparkling blue eyes and her concern for others will be missed. She was a member of St. Michael and All Angels Episcopal Church and was blessed by the ministry and fellowship she received there. She is survived by three daughters, Barbara Roberts and husband, Walter, and Mary Jernigan and husband, Barcus, all of Lake Charles, and Linda Catalano (formerly Weeks) and husband, Pete, of Lafayette; one sister, Mary Johnson, of Kerrville, Texas; eight grandchildren, Bill Roberts, Christy Moreau, Greg Gill, Gordon Gill, Edward Jernigan, Ginny Jernigan, Amy Mutscher and Whitney Weeks; and five great-grandchildren, Burnham and Margaret Roberts, Katelyn and Megan Gill and Cade Mutscher. She was preceded in death by her husband of 68 years, A.B. "Beechie" Henshaw; her parents, Charles and Frances Allen; a daughter, Frances Gill; and her brothers, Ned, Tim, Bill and Phil Allen. The family remembers with gratitude the innumerable kindnesses of all who have assisted in so many ways. Especially appreciated are the long term loving services of caregivers Josephine Abassi, Dana Daigle, Lenora Frank, Jerry Landry and Lena Basile. Visitation will be observed from 6 p.m. until 9 p.m. today in Hixson Funeral Home and will continue from 9 a.m. until the time of service Thursday in the church. Memorial donations may be made to Odyssey Healthcare of Lake Charles, Calcasieu Women's Shelter, St. Michael and All Angels Episcopal Church or to the charity, church or group of one's choice. Hixson Funeral Home of Lake Charles is in charge of arrangements. 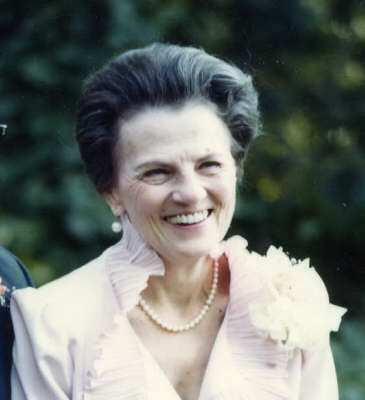 Barbara Allen Henshaw, 90, of Lake Charles, died Sunday, Jan. 30, 2005, in her residence. She was preceded in death by her husband of 68 years, A.B. "Beechie" Henshaw; parents, Charles and Frances Allen; daughter, Frances Gill; and brothers, Ned, Tim, Bill, and Phil Allen. She was born in Eau Claire, Wis., and moved with her family to Lake Charles when she was 11. The Allen family lived for many years on Kirby Street in the home that later became the site of the YMCA. Barbara was a graduate of Lake Charles High School, and leader of the first drill and pep squad there. She is survived by three daughters, Barbara Roberts and husband Walter, and Mary Jernigan and husband Barcus, all of Lake Charles, and Linda Catalano (formerly Weeks) and husband Pete of Lafayette; one sister, Mary Johnson of Kerrville, Texas; eight grandchildren, Bill Roberts, Christy Moreau, Greg Gill, Gordon Gill, Edward Jernigan, Ginny Jernigan, Amy Mutscher, and Whitney Weeks; and five great-grandchildren, Burnham and Margaret Roberts, Katelyn and Megan Gill, and Cade Mutscher. Barbara was a beautiful, gracious woman whose lifelong interests included a love for reading, good music, playing bridge, travel, dancing, entertaining in her home, and active correspondence with distant family and friends. She loved life and wanted to try it all. She had a great desire to learn all she could about everything. She set the bar high and aspired to the excellent and beautiful. She loved the classics -- symphonies, ballet, lectures, movies. Adventurous, courageous, fearless, fun, Barbara was an energetic woman who loved spending time with family and friends. She was a devoted wife, a generous and loving mother to her children, and a faithful friend to many. Her ready smile, her sweetness, her wit, her sparkling blue eyes, and her concern for others will be missed. The family remembers with gratitude the innumerable kindnesses of all who have assisted in so many ways. Especially appreciated are the long-term loving services of caregivers Josephine Abassi, Dana Daigle, Lenora Frank, Jerry Landry, and Lena Basile. Her memorial service will be at 10 a.m. Thursday, Feb. 3, in St. Michael and All Angels Episcopal Church. The Rev. Dr. Peter Cook will officiate. Graveside service will be at 3 p.m. in Rose Hill Cemetery in New Iberia, under the direction of Hixson Funeral Home of Lake Charles. Visitation is 6-9 p.m. Wednesday, Feb. 2, in Hixson Funeral Home and from 9 a.m. Thursday, in the church. Memorial donations may be made to Odyssey Healthcare of Lake Charles, Calcasieu Women's Shelter, St. Michael and All Angels Episcopal Church, or to the charity, church, or group of one’s choice. Contribution from Ann Marsh Stockmeyer Roberts.